The field boot is ideal for fisherman, shooters, farmers or even dog walkers. The boot has a 100% waterproof rubber base with 98% waterproof suede laced upper. The removable liner is made with English Wool for warmth with wicking fibres that keep the feet free from perspiration. Aluminium is sandwiched between the layers to reflect the heat. Looking to buy some Boots / Waders as part of a fishing gift? If you would like some advice on purchasing Boots / Waders, simply contact our expert fishing team, giving us either an email or phone number on which to contact you and we'll get back to you right away with the best advice and prices. 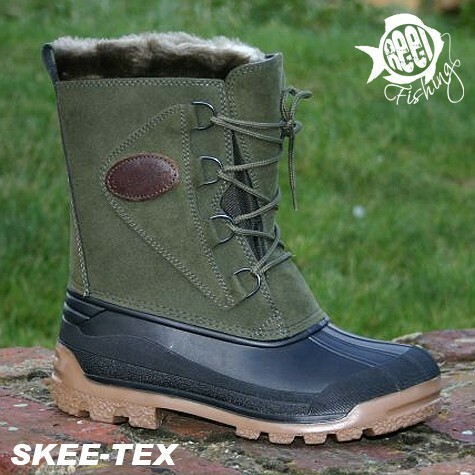 FREE Delivery on all Skee Tex Boots / Waders over £100!! !